GBA Crash Bandicoot 2: N-Tranced (USA) in 34:19.83 by wwmarx. Crash Bandicoot 2: N-Tranced is similar to Crash Bandicoot 3: Warped for the PlayStation. 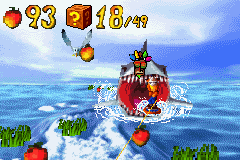 In this game, Crash is trying to rescue his friends from the hypnosis of Doctor Nefarious Tropy and his ally N. Trance. To do this, he must collect Power Crystals to open portals to new areas and move closer to the captured Bandicoots and N. Tropy's hideout. wwmarx runs, jumps, and slides with precision to rescue Crash's friends and beat N. Tropy as fast as possible.